The Environmental Protection Agency (EPA) had scientific evidence proving a hydraulic fracturing company, Range Resources, contaminated a local drinking water supply in Fort Worth, Texas, issuing a local warning to residents. When Range Resources threatened to not cooperate with a study into hydraulic fracturing, the EPA changed its course and set aside its analysis that concluded Ranges Resources’ drilling activity may have been to blame. EPA asked an independent scientist named Geoffrey Thyne to analyze water samples taken from 32 water wells near Range's Parker County wells. In the report obtained by the Associated Press, Thyne concluded through chemical isotope testing, that the gas in the drinking water of Fort Worth, could have originated from Range wells. 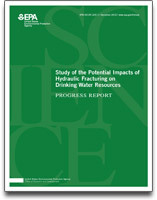 EPA was seeking industry leaders to participate in a national study into hydraulic fracturing. Range Resources told EPA officials in Washington that so long as the agency continued to pursue a "scientifically baseless" action against the company, it would not take part in the study and would not allow government scientists onto its drilling sites, according to company attorney David Poole.